In the aftermath of the battle, Teams 7 and 10 return to Konoha. 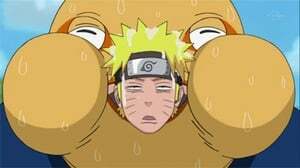 After examining Naruto, Tsunade officially classifies Naruto's new technique as a Forbidden Jutsu and warns Kakashi never to let him use it again. What is the terrible secret of the Rasen Shuriken that has left even Tsunade stunned by its power? Meanwhile, Orochimaru orders Kabuto to search for a woman who will help him reach his goal. As Naruto recovers from his injury, Kakashi prepares to tell him the grim news about his new technique. Meanwhile, Sasuke secretly trains and has an encounter with a strange young girl. 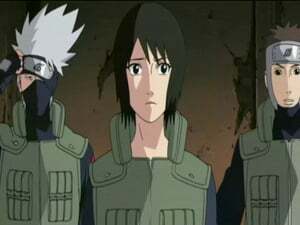 Kakashi leads Kiba, Hinata, and Shino on a mission to infiltrate Orochimaru's lair. What horrors and traps await them? 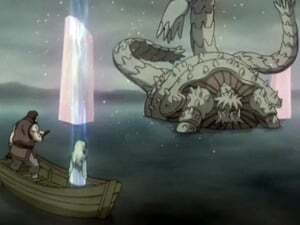 Kabuto and Yūkimaru travel to a lake, where Kabuto attempts to draw out a mysterious creature. Guren branches off from her men to find Orochimaru, who has Sasuke fight an army of Sound Ninja as training. Sasuke defeats them all, but declares that he wants to kill Itachi more than them. Naruto continues his training by summoning Gamakichi and Gamatatsu, but still doesn't understand the concept of connecting to another person's heart. Kabuto and Yūkimaru arrive at the Hot Springs Village where Naruto and Jiraiya are. Naruto runs into unexpected difficulties as he trains with Gamakichi and Gamatatsu. 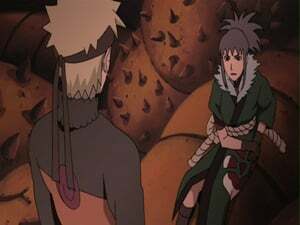 While Kakashi's group searches for Guren and her gang, Yukimaru seems to develop interest in Naruto. Kabuto assigns Guren to look after Yukimaru. Guren isn't all too happy about the assignment, and things only become worse when Yukimaru falls ill on a rainy night. Elsewhere, Kiba discovers the mystery of where the dog whistle is coming from, and Tsunade sends assistance to Kakashi and Team 8. While Naruto continues his training with Gamakichi and Gamatatsu, Yamato, Sakura, and Sai prepare to leave and back-up Kakashi's group. 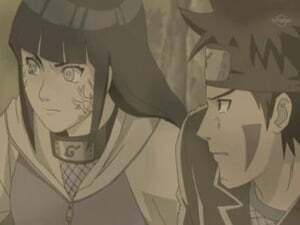 As Guren and her gang prepares to intercept Kakashi's group, Yukimaru grows concerned for her safety and gives her a charm in hope of a safe return. While Naruto continues practicing a combo attack with Gamatatsu, Kakashi, Kiba, Hinata, and Shino have a run-in with Guren's gang. Will Kakashi and Team 8 be able to defeat these strange foes? In Konoha, Tsunade discovers they have an enemy using Crystal Style. 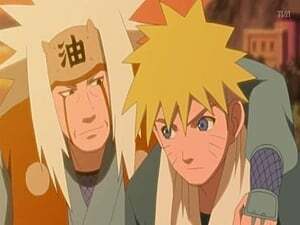 While on his mission with Team Kakashi, Naruto meets Yūkimaru once again and talks to him. Guren puts a gigantic Crystal Prison over the forest trapping Team Kurenai inside. Guren then prepares six Crystal Clones and attacks Team Kurenai with them. Hinata defeats one clone but is locked up in a Crystal Prison by another. Team Kakashi reaches the borders of the giant prison and Naruto uses his new Jutsu with Gamatatsu to bust a way in. 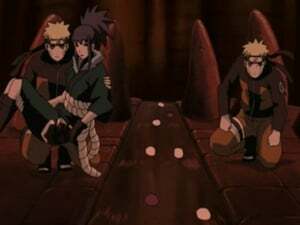 Naruto successfully breaks down the crystal labyrinth with his new jutsu and he and the rest of Team Kakashi come to Kakashi, Kiba and Shino's aide, and rescue Hinata as well. Meanwhile, Kabuto, Guren, Yukimaru and Gozu head to the lake Kabuto and Yukimaru went to before. What could be in the lake that Orochimaru wants? 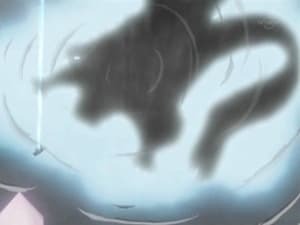 Yūkimaru summons the Three-Tailed and immobilizes it while Guren tries to capture it. It manages to break free and attack. Kakashi tells Naruto to investigate the lake, while they find Rinji and the others. Rinji and his men prepare an ambush, but Hinata, Sakura, and Sai arrive to avert it. Naruto summons Gamakichi and Gamatatsu and approach the Three-Tails, where they see Yūkimaru and learn of his allegiance to Guren. Trying to save Guren, Yūkimaru tries to suppress the Three-Tails once more, before managing to escape with her. Guren is rendered unconscious and relives her past as Naruto is caught in an illusion about Sasuke. After Kakashi finds him, Teams Kakashi and Kurenai conclude the mist around them causes Genjutsu courtesy of the Three-Tails. After Guren wakes up, Yūkimaru suffers another fever and passes out. Tsunade hears of the Three-Tails and assmbles Shizune, Ino, Tenten and Lee to go and seal it before the Akatsuki do. 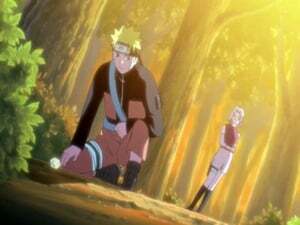 Naruto and Sakura talk about the home that people should return to before Naruto heads off to find Yūkimaru. Naruto runs into Guren while trying to find Yūkimaru. Yamato and Kakashi find Naruto and bring him back to the group. 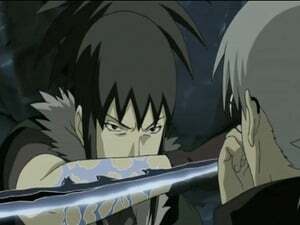 Kabuto tells Guren that Yūkimaru is only a tool to control the Three-Tails, which upsets Guren. Meanwhile, Shizune, Ino, Tenten and Lee meet up with the team and tell them that their new mission is to rescue Yūkimaru and capture the Three-Tails before Orochimaru's group can capture it. Shizune, Ino, Lee and Tenten arrive and Kakashi, Shizune and Yamato discuss about a strategy to seal the Sanbi and rescue Yukimaru. Meanwhile, Kabuto and Rinji notice Guren's care for Yukimaru and become concerned. The sealing unit prepares the sealing barrier and the other two teams go into battle with Guren and her henchmen. Kakashi, Naruto and Sai stall Guren and Gozu while Shino prepares to go against Guren's crystal style. Meanwhile, Lee goes against Guren's other henchmen and gets trapped in their smokescreen. Can Lee find a way to defeat them? 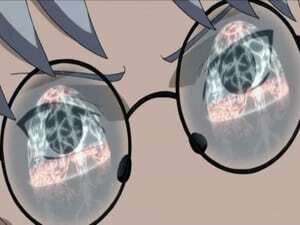 After Shino finishes preparing his insects, he goes against Guren's crystal style. 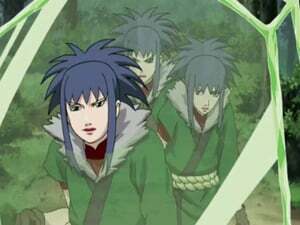 Elsewhere, while Shizune, Sakura, Ino and Hinata are bringing the sealing barrier to the Sanbi, they are being watched by Tobi and Rinji. Kabuto plans on breaking Leaf’s The Four-Corner Sealing Barrier from the inside by using Yukimaru’s power and have the Three-Tailed Beast go on a rampage. Yūkimaru falters and the Three-Tails injures Guren. Rinji tells Yūkimaru to suppress the beast to save her, but he is unable to do so. 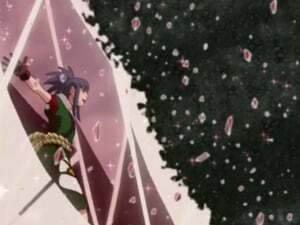 Guren leaves her position and protects Yūkimaru with a Crystal Style shield. Naruto goes out to find Yūkimaru, but ends up fighting the Three-Tails with Guren. Despite their efforts to defeat it, the beast overpowers the two of them, and then it proceeds to swallow them. 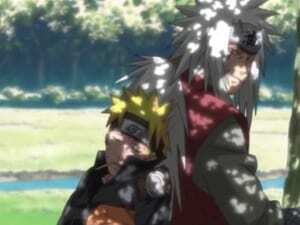 Meanwhile, Kakashi, Shino and Sai find Yūkimaru unconcious and flee with him, leaving Kabuto frustrated. Guren tries to attack Naruto within the Three-Tails, but, in her weakened state, is unable to do so and passes out. Meanwhile, Kakashi tells Sakura and Ino to heal Yūkimaru while he, Shizune, Kiba, Sai, and Hinata search for Naruto. Naruto and Guren soon encounter a horde of mini Three-Tails that try to attack them, but they evade them and begin to argue about Yūkimaru. While Yūkimaru awakens, Naruto summons a bunch of Shadow Clones to look for a way out of the beast's stomach. Elsewhere, Kabuto gives Curse Marks to Rinji's men. Yukimaru informs Kakashi and the others to Naruto and Guren's whereabouts and they attempt to free them with Yukimaru's help. 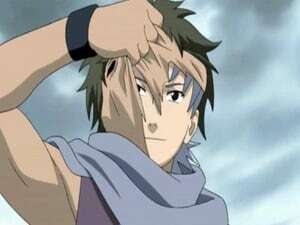 Kiba, Tenten and Lee once again battle Kihou, Kigiri and Nurari after gaining more power from Kabuto. Naruto and Guren continue to search for a way out, coming across human-sized Sanbi-like creatures and illusions. Will Naruto and Guren ever find a way out? 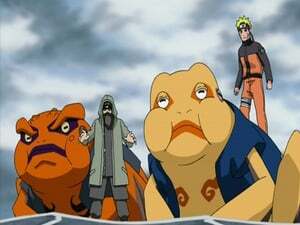 The Sealing Team prepared to start sealing the Three-Tails and tell Sai to take Yūkimaru somewhere safe, but he gets attacked by Kabuto's men. 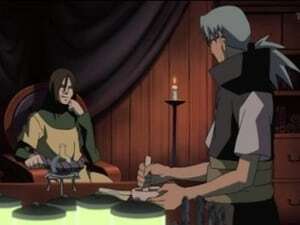 Kabuto meanwhile prepares his plans while Lee, Tenten, and Kiba are also attacked. Rinji finds his men and converts them back to his side, ordering them to attack the Sealing Team; they're stopped by Kakashi, Yamato and Shino. Rinji then makes Yūkimaru eat the pills to control the Three-Tails, which Naruto and Guren learn about. Katsuyu arrives to help the sealing team with the sealing barrier. 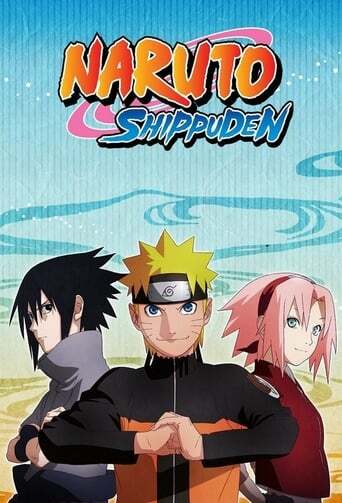 Naruto and Guren arrive to save Yukimaru from Rinji, but after Guren and Yukimaru have a brief discussion, Rinji reveals the truth about Guren to Yukimaru in hope that he'll make the Sanbi go wild. What will Yukimaru's reaction be when he discovers Guren killed his mother? The sealing team continue their efforts to seal the Sanbi while Kakashi and the others face against a monster fused together by Kigiri, Nurari and Kihou. Kabuto reveals Orochimaru's plans involving the Sanbi and he and Naruto begin to fight. While protecting Yukimaru, Guren fights against the real Rinji, who has been resurrected by Kabuto. When Guren sacrifices her life to save Yukimaru, Yukimaru's powers go into full effect. Now, in order to protect Yukimaru, Naruto prepares to go against the rampaging Sanbi. The battle for the Sanbi comes to an end as neither the Konoha ninja nor Orochimaru are successful at obtaining it. Tsunade classifies the mission of catching the Sanbi as a failure, for it is too dangerous to accomplish. 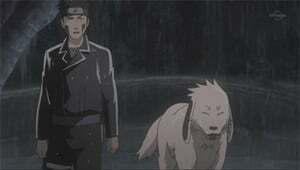 As Naruto and the others prepare to return home, Yukimaru goes missing. Unbeknownst to everyone, Akatsuki lies in wait, and they have their own plans for the Sanbi.